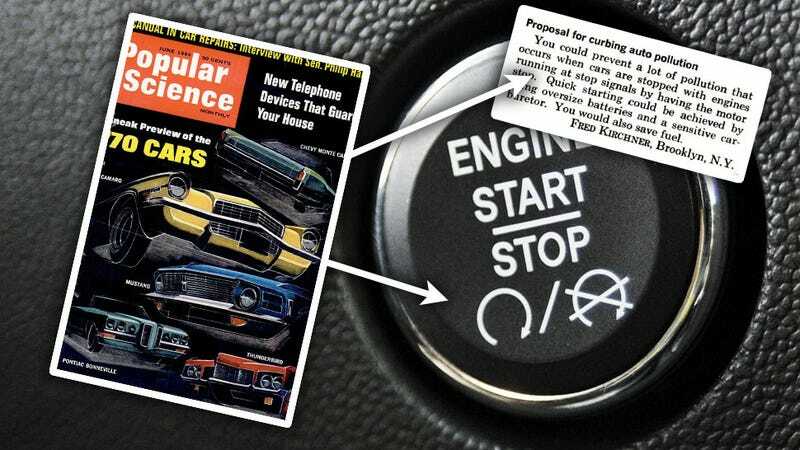 Did Some Unknown Rando Invent Stop-Start Technology In 1969? I think, over the course of a number of posts, we’ve established a few crucial things: first, my bowels are so regular the atomic clock people at the US Naval Observatory occasionally use them for calibration, and second, I have a huge stack of ‘60s era Popular Science magazines by my toilet. These two facts conspired to let me discover gems like this: stop/start technology may have been invented by some nobody in Brooklyn. So, let’s look at what Fred Kirchner of Brooklyn is saying here. Having your car shut off instead of idling would save fuel and cut pollution. And, to get the car to start up again quickly, you’d use “oversize” batteries, and a “sensitive” carburetor (that means it likes to read carburetor poetry and isn’t ashamed for you to see it cry/leak gas). Fred said all this stuff in 1969. Today, in the year of our dear and hungry lord 2015, many cars come with an option commonly known as ‘stop-start’ technology. That technology shuts down a car’s engine at idle to cut emissions and save fuel, and it accomplishes the rapid restart by, usually, having an additional battery to handle the extra load. Essentially, the exact same thing – for the exact same reasons – that Mr. Kirchner suggested 46 years ago. So, was Fred really the first? Maybe, maybe not, but I have no reason to think he didn’t come up with the idea independently, and, I’m almost certain he was the first to propose the idea publicly in the US, and possibly the world. So, Toyota was showing and testing this publicly in 1974, five years after Fred Kirchner wrote his letter. Sure, it’s quite likely Toyota’s engineers had come up with the idea, but quite unlikely Fred knew about that. So, I’m going to go ahead and say Fred Kirchner is an unsung visionary of automotive fuel economy and clean emissions. Maybe I’ll even start calling stop-start systems the “Kirchner System,” because if he’s still around (a quick search showed at least one 82-year-old Fred Kirchner in Brooklyn) I bet he’d appreciate the gesture. So, good job, Fred! Even if almost everyone I know hates the Kirchner System and shuts it off, it actually really does save gas and help keep CO out of the air!